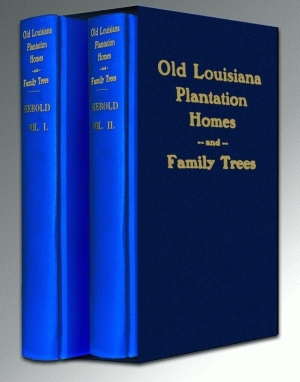 Originally published in 1941, Old Louisiana Plantation Homes and Family Trees is the definitive guide to the important plantation homes of the Pelican State, as well as the socially and historically prominent families who lived in them. Volume I of the two-volume, boxed set describes structures in several diverse sections of the state, from traditional, Spanish-moss-hung plantations in south Louisiana to the African-inspired structures on the rounds of Melrose Plantation in Natchitoches Parish. The first volume features many rare photographs of historically significant townhomes, plantations, and outbuildings—many no longer extant—and provides detailed genealogical and anecdotal information on a genteel society and lavish lifestyle that is now only a cherished memory. Some of the great houses discussed include D’Estrehan, Tezcuco, Seven Oaks, Parlange, Asphodel, Evergreen, and Rosedown. Volume II traces the history of several important families and features numerous portraits, coats of arms, and archival photographs. It also contains a wealth of genealogical and biographical information about many of the most prominent families in Louisiana history. Some of the family names included are La Frenier, De Livaudais, Forstall, Fortier, Schmidt, Séghers, Milliken, Parlange, De Brierre, D’Herbigny, Butler, Pipes, Ellis, Percy, Plauché, Barrow, Bringier, Kenner, Stauffer, Knox, Semmes, Walmsley, Ranlett, Smyth, Sully, De Marigny, De La Ronde, Almonaster, De Dreux, Villere, Beauregard, Matthews, Rathbone, De Buys, Hicky, Duggan, De Macarty, vonPhul, Cade, Du Brocca, Allain, D’Estrehan des Tours, De La Barré, Koch, Muller, Bruce, Boehm, Seebold, De Bachellé, De Vilbiss, De Beaulieu de Marconnay, Konzelman, Parker, Pitkin, Levert, Ware, Prudhomme, Wilkinson, and Stewart. Vol. I - 564 pp. 6 x 9, 108 photos 98 illus. Vol. II-286 pp. 6 x 9 , 180 b/w photos 169 b/w illus.